The Jacobsen Circular Dining Table is Inmod's high quality and highly accurate re-make of Jacobsen's original design. A clean white melamine top sits upon an ultra strong cast aluminum base. Update your dining space with this ultra modern yet exceptionally functional dining table and transform your home at an affordable price. Origins by Inmod's stylish yet functional Jacobsen Circular Dining Table delivers minimalist, ultra modern design in its most simple and aesthetic form � the perfect centerpiece for nearly any updated dining room's design scheme! The contemporary dining table features a classic round table top constructed from tough and durable melamine and supported by a sturdy cast aluminum stainless steel base. A crisp white finish on the table top enhances the Jacobsen Circular Dining Table's fresh, modern design while rubber feet on the base are safe on fragile floors. Where is the table made. 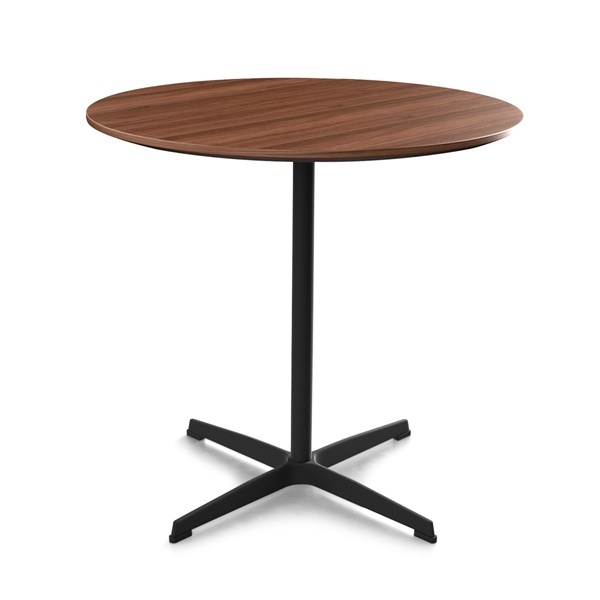 The Jacobsen Circular Dining Table is manufactured in China. Is the walnut table top made from melamine or walnut veneer? If it is veneer, is it protected by a lacquer finish? The walnut finish is made with a walnut veneer, which has a protective finish to help protect against water absorption / discoloration. We still recommend using coasters / trivets, cleaning up spills promptly, and keeping the table away from direct sunlight.